Insider’s Guide to Art Basel and Art Week in Miami: Just go! 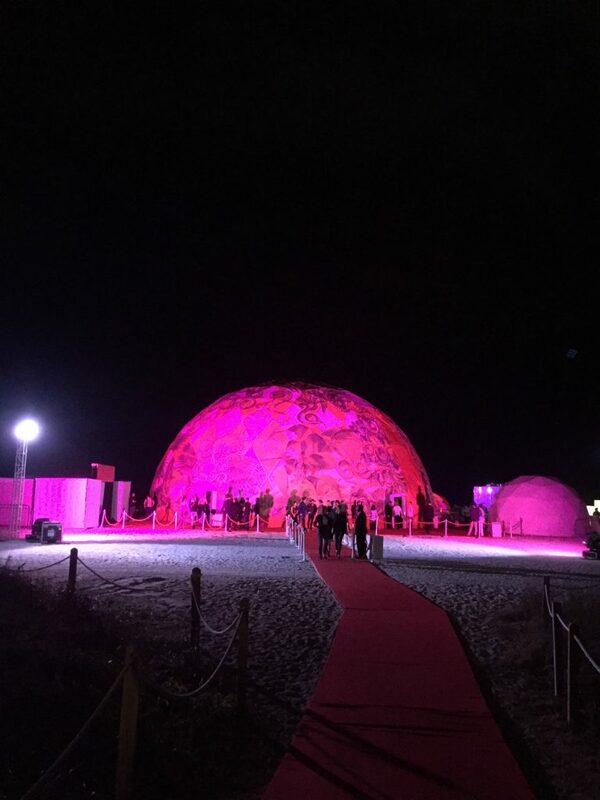 The biggest Art Week in Miami happens in early December, when the world-class art circus that is Art Basel Miami rolls into the big-top Miami Beach Convention Center from Dec. 6-9. But there are also dozens of satellite fairs, outdoor sculpture exhibits, fair tents on the beach, parties and new shows in the museums that get started earlier in the week of Dec. 4-9, and are just some of the things that draw art-loving jet-setting hordes here. There are some things to know before heading down to Miami – and you really should go, for all the perceived hassle, there is nothing like it in the world for a week. Traffic and parking are as bad as you may have heard and probably worse, but salvation has come in the form of the new Brightline train running from downtown West Palm to downtown Miami in about an hour with a stop in Fort Lauderdale. Brightline — soon to be Virgin Trains — is really remarkable, with three levels of service from Smart to SmartPlus to the top level Select, which includes a deluxe lounge – new colorful patchwork mural art from Miami artist Typoe Gran graces the walls – with a buffet prior to departure (there’s your breakfast), then hot towels, magazines, free drinks and food service once on board (there’s your lunch). There is security everywhere and the stations and trains are clean, new, and comfortable with wi-fi, laptop tables, outlets, space for bicycles, pets allowed and multiple attendants on board to answer any questions. As a bonus, the train cruises through the Wynwood Art District, allowing a rarely seen view of the murals and sculptural art installed on the railroad track back side – and there is lots of it for several blocks on the west side of the train. From the Miami station, which has cafés, shops and even condos being built in this new mini-city, you can take the free Metro Mover to downtown fairs like Art Miami and Context. A trolley service from Bayside can take you to the beach fairs. Any other destination can easily be accessed by Uber or Lyft. offers more info on connections, groups passes and special offers. When you go, it’s a smart idea to plan at least few hours at each fair and map the location of the fairs to one another. Going to Art Basel Miami is a full day in itself as the new fair layout by Amsterdam-based firm Tom Postma Design will bring more exhibition space, larger booths and wider aisles — along with four entrances to the halls. 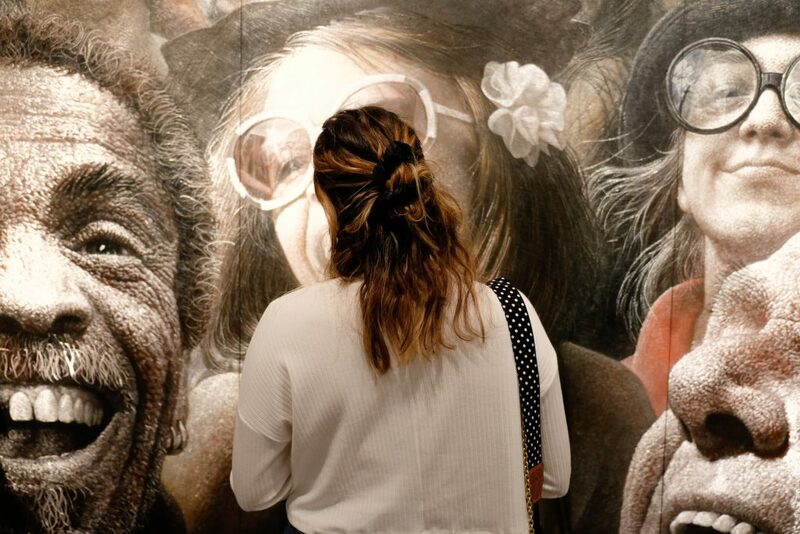 There are hundreds of booths with the best art the world has to offer, special sections like Nova, Editions, Position, Kabinett, Survey – all specially curated booths to expand art exhibits. Latin American perspectives, Afro-Caribbean spirituality, and experimental painting mark this year’s Galleries sector. Panels, conversations, film screenings on the wall of the nearby Soundscape Park and at the Colony Theater, along with people-watching, fill in the rest. Expect better food options and more places to relax this year as the Convention Center has installed a rooftop lounge and plaza area. 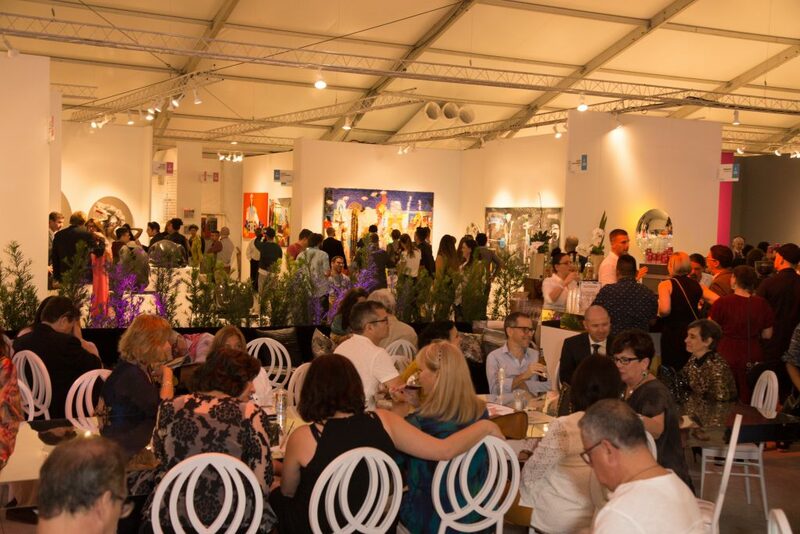 Multiple fairs dot the actual beach and along Collins Avenue – Design Miami, Aqua Art Fair, Ink Miami Art Fair, Muse, Pulse Contemporary, Scope, Superfine and Untitled. In addition many hotels host pop-up exhibits in their lobbies, particularly the elegant Deco Hotel Sagamore. Each fair has a slant of what kind of art they show, so check the websites if you are looking for something particular. These are all pretty much within walking distance and again, Uber and trolleys can also get you anywhere. A few must-see exhibits include the annual Public Sector sculpture installation in Collins Park in front of the Bass Museum – a wild and woolly lineup of huge, ambitious work. Past sculptures of a 50-foot deer, a roller coaster made of 25-cent kiddie rides, a drag queen disco, and a barbecue in the flaming trunk of a limo are some standouts. And it’s free. If you get hungry, I suggest The Dutch in the nearby W Hotel, whose lobby contains work from Warhol, Kenny Scharf, Jean-Michel Basquiat, Mike Kelley, and Christopher Wool. And the Faena complex of hotel, art forum and shops, on Collins Avenue in the mid-30s blocks, has the most beautiful mosaic hotel lobby in Miami and a gold-leafed full size mastodon skeleton by Damien Hirst out by the pool. More free-to-see mind-blowing art. If that’s not enough, a full day or two or three can be spent on the mainland. 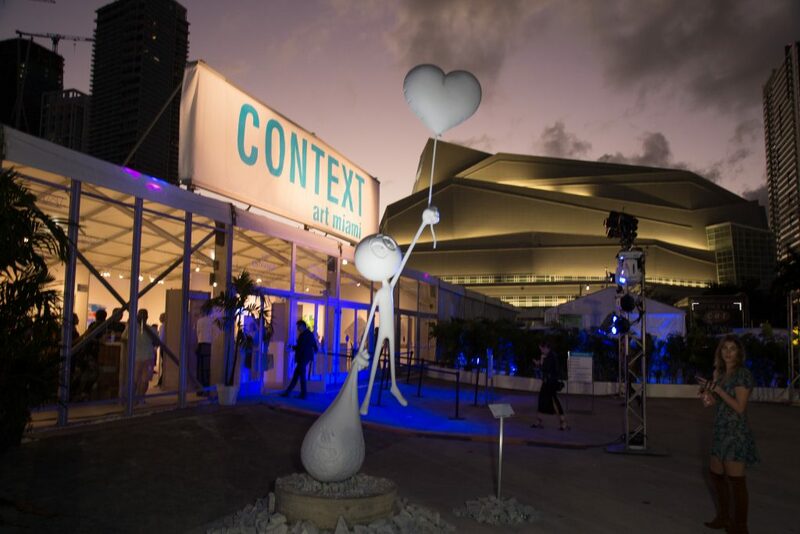 The downtown Arts and Entertainment District has Art Miami, Context, NADA and the Satellite Art Show. Art Miami has a huge beautiful tent right on the scenic Biscayne Bay where the Miami Herald newspaper offices stood for decades. In terms of quality and cutting-edge work, this is the fair to see, as the organizers also do the circuit in New York, the Hamptons and West Palm Beach. The tent connects to Context right next door so you can see two fairs in the same location. 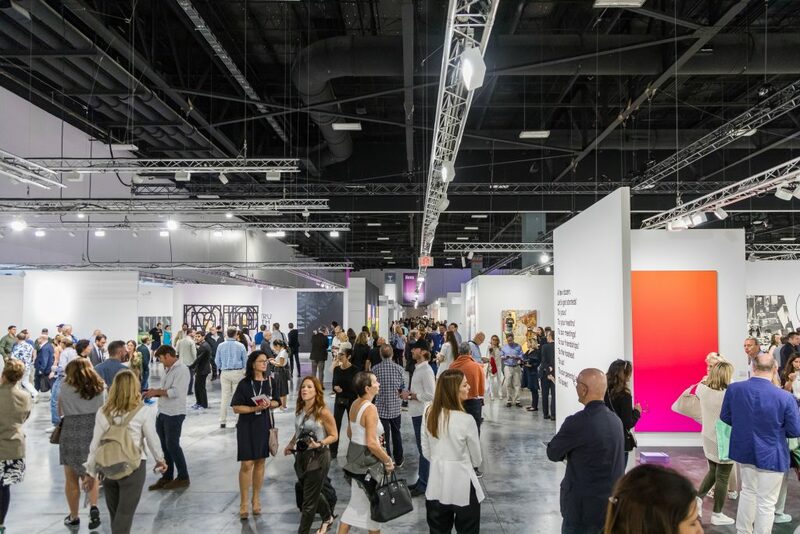 “Art Week visitors can look forward to seeing the most important artworks from the 20th and 21st centuries, as well as never-before-seen pieces, dynamic projects, special installations, and more from more than 300 international galleries at our three fairs – Art Miami, Context Art Miami and Aqua Art Miami,” says Art Miami Fair Director Nick Korniloff in an email. 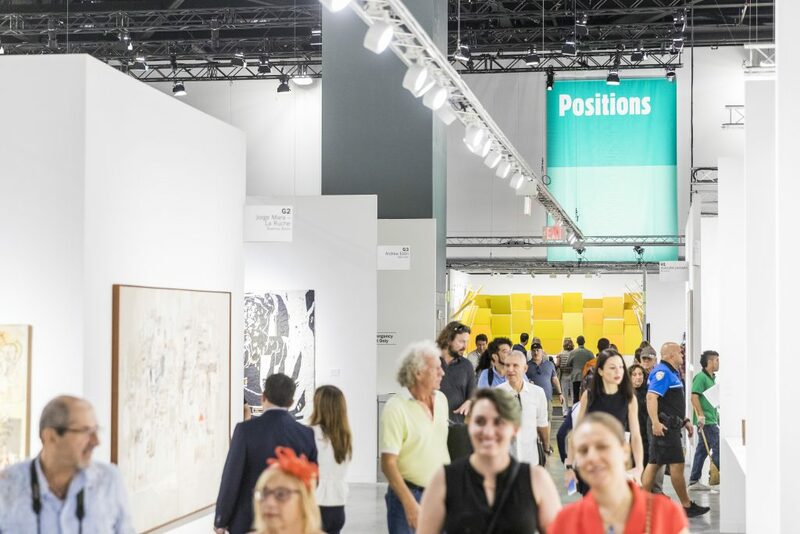 “Many of the exhibitors at Art Miami have shown at ADAA, Art Basel, The Armory Show, Design Basel TEFAF, Masterpiece London and EXPO Chicago, so our visitors can look forward to seeing an exceptional quality of artwork from blue-chip artists, modern masters, mid-career, emerging and cutting-edge artists. “Art Miami alone will present more than 800 of the top blue-chip artists of the modern, post-war and pop eras as well as master works by artists including David Hockney, Pablo Picasso, Alexander Calder, Willem de Kooning and Roy Lichtenstein,” Korniloff said. Further west is the Fridge Art Fair, Miami River Art Fair and Prizm, and Overtown now boasts Art Africa Fair. Another full-day tour is well-spent in Wynwood, where blocks and blocks of outdoor murals are a colorful multi-story show in itself. 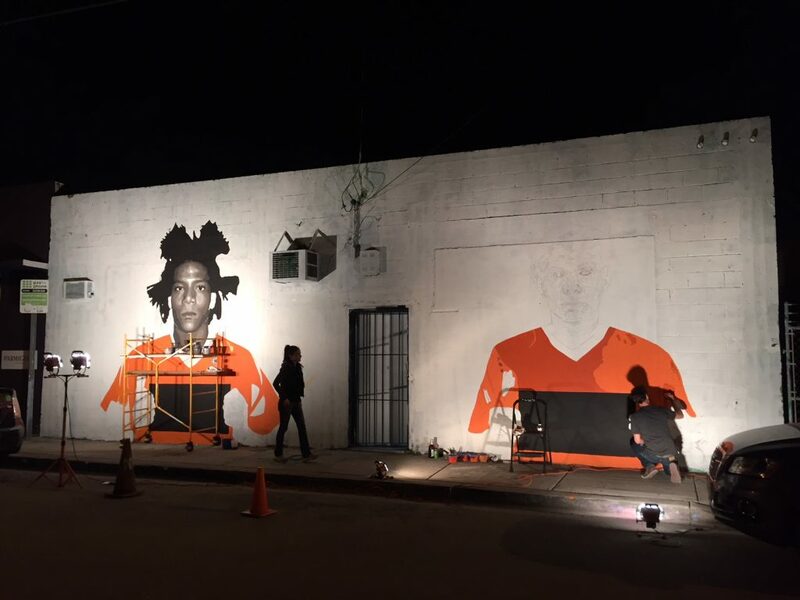 In addition to the well-curated murals at the official Wynwood Walls Garden and Gallery there is the creative word art gallery of Peter Tunney, and Wynwood Kitchen, where street artist-turned-global activist sensation Shepard Fairey has designed the walls and the server uniforms. Fairs in Wynwood include Pinta, Red Dot and Spectrum. 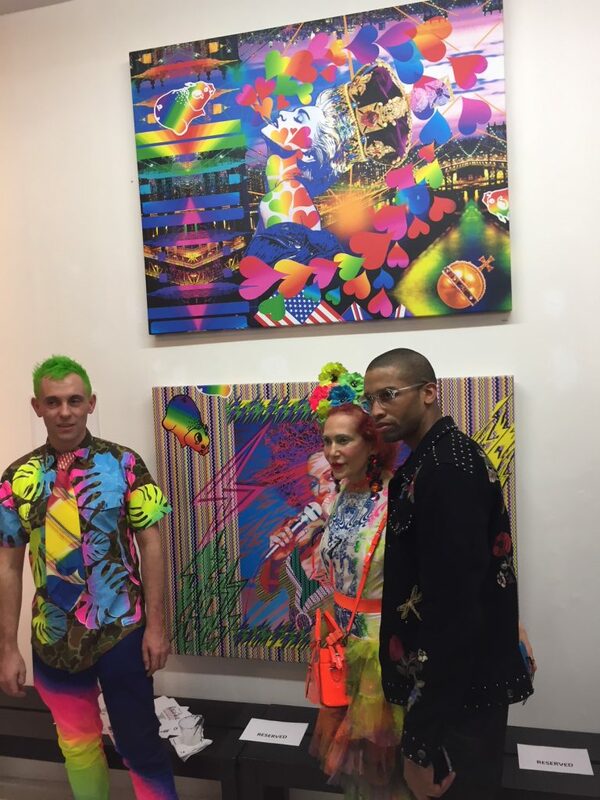 Emmy-winning designer Pat Fields brings her Art Fashion tribe to Wynwood for the full month of December, showcasing genre-bending artists in striking clothing. One of her artists, Daniel Chimowitz, has a one-man museum show at The Jewish Museum through February. The Rubell Family Collection is well worth a visit, as this art-centric mega-collector family is mainly responsible for bringing Art Basel Miami here to begin with and they always refresh their mammoth collection annually to coincide with Art Fair Week. For the best in world-class fashion and art head to the Design District, newly completed with additional plazas and public art from the collection of District owner Craig Robins. Outdoor sculpture, murals, art-infused architecture and a selfie favorite, the Flys Eye Dome by Buckminster Fuller, punctuate this gorgeous district. 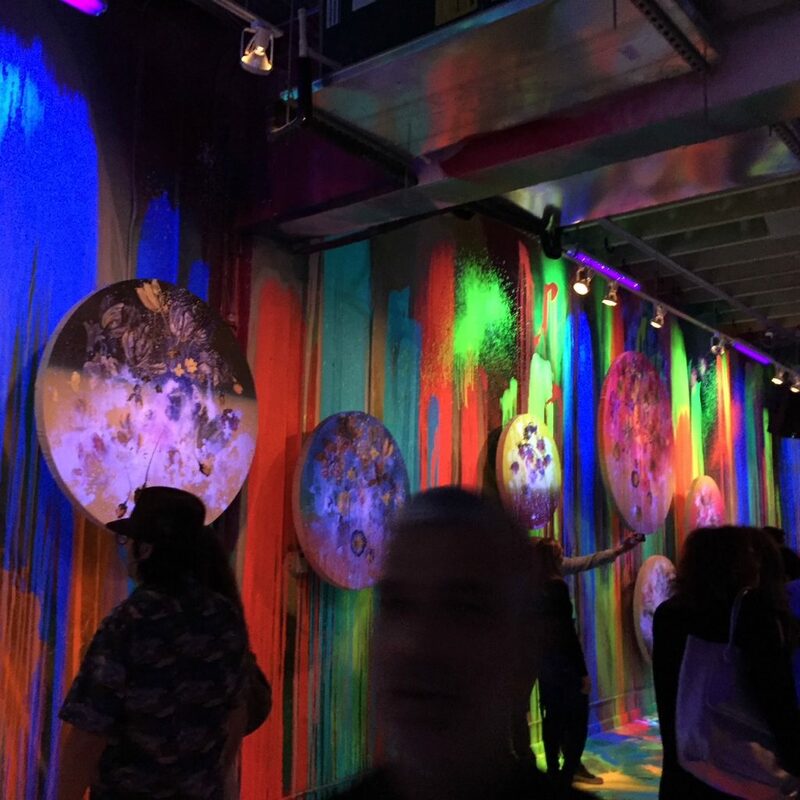 Over at the Moore Building, an annual one-week exhibit by the powerhouse dealer team of Larry Gagosian and Jeffrey Deitch occupies all four floors with themed shows that bring out the A-listers. A new gallery row on 39th Street finds Miami artists Magnus Sodamin and Typoe Gran in new spaces, while their dealer’s gallery Primary Projects holds down the corner location on North Miami Avenue. Many of the luxury stores collaborate with top artists for window displays, i.e., the Jeff Koons sculptures at Louis Vuitton. Miami-bred superstar Gloria Estefan has a restaurant here, Etsefan Kitchen, with art on the gleaming Mediterranean blue walls by award winning international artist Carlos Betancourt who started out in the 1980s with a studio he lived in on Lincoln Road.